The annual number of deportations reached a record 419,384 in fiscal year 2012, according to newly released data from the U.S. Department of Homeland Security. 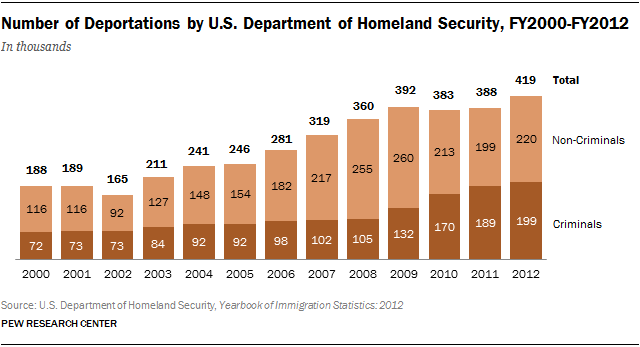 Between 2009 and 2012, the Obama administration deported 1.6 million immigrants. By comparison, two million immigrants were deported during the eight years of the George W. Bush administration. The record number of deportations shows a rise in both deportations of those with a prior criminal conviction (a record 199,000), and those without a criminal conviction. This rise in the number of deportations in fiscal year 2012 also coincides with a rise in the number of border apprehensions (mostly at the U.S.-Mexico border), which increased from 340,000 in 2011 to 365,000 in 2012. Recently released immigration enforcement statistics by Immigration and Customs Enforcement (ICE) show that the number of deportations done by ICE agents during fiscal 2013 was down compared with 2012. Final data on the total number of deportations for 2013, including both ICE data and Customs and Border Protection (CBP) data, are not yet available.